Preventing boredom when you travel with kids and teens can be challenging—especially if you want to limit the amount of screen time they have. How many games of “I Spy” can you play before someone loses interest? (Answer: not enough to last an entire road trip!) This is why choosing a few audiobooks to listen is essential to your pre-travel checklist. 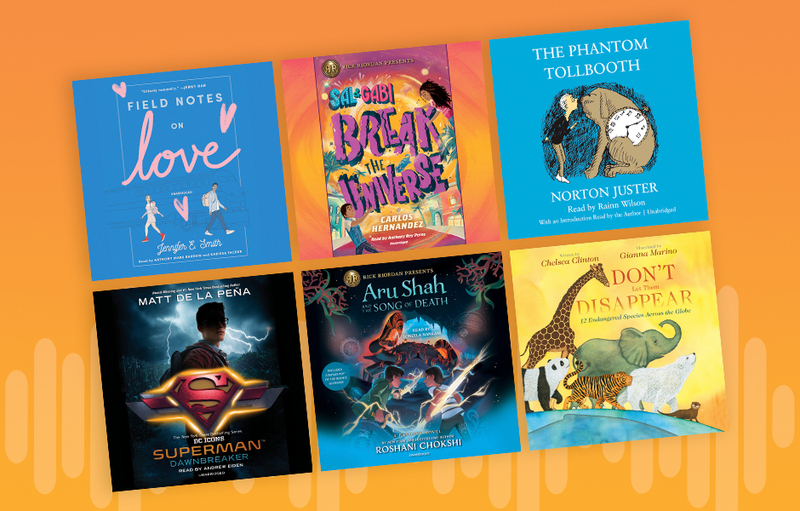 To help you out, we’ve selected a few audiobooks that everyone from little listeners to teen listeners (along with the adults they’re traveling with) will enjoy. In this audiobook, Chelsea Clinton introduces young listeners to a selection of endangered animals, sharing what makes them special, and also what threatens them. Taking listeners through the course of a day, she talks about rhinos, tigers, whales, pandas and more, and provides helpful tips on what we all can do to help prevent these animals from disappearing from our world entirely. This is a beloved classic that adults will love visitng again and that younger listeners will have a fantastic time experiencing for the first time. Part of the Rick Riordan Presents series of titles, this is a sci-fi romp with Cuban influence that will take you all on a fun ride. It poses this question: What would you do if you had the power to reach through time and space and retrieve anything you want? Learn more about the story from author Carlos Hernandez! Bestselling author Roshani Chokshi returns with her sequel to Aru Shah and the End of Time (another wonderful title in the Rick Riordan Presents series of audiobooks). Aru is only just getting the hang of this whole Pandava thing when the Otherworld goes into full panic mode. The god of love’s bow and arrow have gone missing, and the thief isn’t playing Cupid. Instead, they’re turning people into heartless fighting-machine zombies. If that weren’t bad enough, somehow Aru gets framed as the thief. This young adult audiobook isn’t just for fans of Superman; it’s a wild adventure that will enthrall listeners! In this story about Clark Kent as a teenager, he discovers a dark secret lurking in Smallville. Turns out, Clark’s not the only one hiding something. Teaming up with his best friend, Lana Lang, he throws himself into the pursuit of the truth. What evil lies below the surface of his small town? And what will it cost Clark to learn about his past as he steps into the light to become the future Man of Steel? A meet-cute romance about Hugo and Mae, two teens who are thrown together on a cross-country train trip that will teach them about love, each other, and the futures they can build for themselves. For more listening inspiration, read Spring Break Family-Friendly Listens or browse our Family Listening collection!